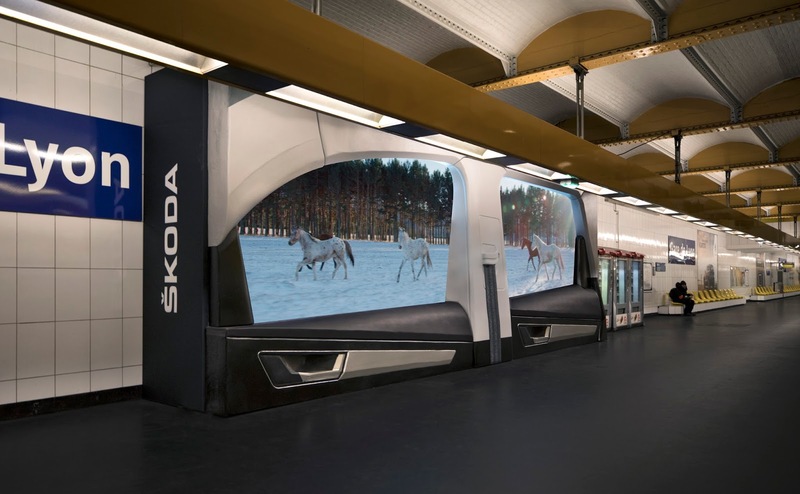 For the launch of its latest SUV, ŠKODA France invites Parisians to escape the daily grind aboard the new, ŠKODA KAROQ, thanks to a ground-breaking OOH campaign in one of Paris’s most frequented metro stations. After the success of its ŠKODA KODIAQ, ŠKODA is now introducing the « KAROQ », a sleek, modern compact version of the SUV aimed at urbanites. With its signature “Another Way” slogan, the new model promises high-quality performance for the daily commute as well as ventures into the countryside. Breaking out of the daily grind has never been so easy. Parisians spend an average of 92 minutes boxed up in the metro every day. In order to fulfill their “Another Way” pledge, ŠKODA and its agency Rosapark have created a unique experience to help commuters escape the daily routine. From December 20 to 26, visitors to the city’s Gare de Lyon will find a new OOH digital installation featuring “Station with a View”, a lm that takes viewers through some of France’s most charming countrysides, from the famed Pyrénées to the posh Ile de Ré. The immersive lm, which was shot from inside a ŠKODA KAROQ outfitted with HD cameras, shows a passenger’s point-of-view from inside the new model, taking viewers out of the city and into dreamy scenic vistas.